MesaStila (formerly known as Losari Coffee Plantation Resort & Spa) is a luxury 5-star resort & spa that incorporates an unparalleled collection of remarkable antiques and enchanting buildings; including Central Java icons such as a Colonial railway station and historic Joglo villas. The property has 23 unique villas set within an area of 22 hectares of outstanding natural beauty, surrounded by cooling highland air, eight mountains, tropical garden and lush vegetation. 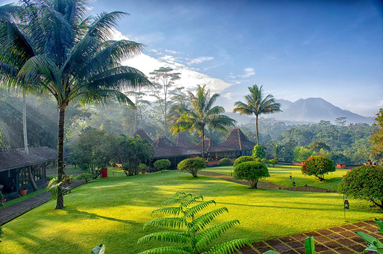 Built within a charming coffee plantation, MesaStila offers distinctly Javanese experiences in both cultural and fitness activities. The true of magnificence of MesaStila is in its spectacular setting and its Hammam Turkish Spa. At MesaStila, the focus is on luxury while keeping the traditional, local and wholesome experiences intact. This accentuates the magnificent environment, the people, the culture and facilitates a healthy lifestyle full of wonderful experiences. Heritage buildings and set in a charming coffee plantation, surrounded by breathtaking mountain scenery, fresh air and lush vegetation. The only Turkish Hammam Spa in Java. Staying options from bed & breakfast to retreat and leisure packages. The best place to organise cycling and trekking to jungle – mountains. Close to nearby iconic tourist attractions (Borobudur, Prambanan, Gedung Songo, Ambarawa Train Museum & Steam Tour, Dieng Plateau). Recommended for everybody looking for a really unique hotel, set in a working coffee plantation in Central Java in the vicinity of Borobudur.